Whether you’re an undergraduate or post-graduate and looking for your first internship placement, you’ll need to prepare for a job search. Yeah, you heard me. But before you start looking for your internship placement, you will need to gather some information together including details and dates of your educational background, as well as your skills, and any volunteer or informal work experience you have. If you are applying in-person for your first summer internships, here’s what to wear, what to bring, and the details that you need to know before you start applying. Don’t give up on your IT application, follow-up a few days after your application with a phone call or email the hiring manager reiterating your interest. If you have applied in person, stop in again and mention that you are really interested in the opportunity. Don’t apply only at one place and wait to hear from the HR. Use resumes distribution services like this one that help you to distribute your application to 500+ sites and over 5000+ recruiters out there. On your part, complete as many SIWES applications as you can, and consider a variety of organizations. The more you apply the better chance you have of finding a job. If you have a connection, use it. Does your relatives shop regularly at the store where you’d like to work? If so, let them mention that you’re looking for a internship placement. This is your easiest way of getting that your first job placement and you will agree with me that many students in Nigeria got their internship placement through this means. Testing is now a necessity, whether you are applying for Oil Industry Scholarship Awards, General Scholarship Awards and even Industrial Training Attachment. It is pertinent that you will have to take a test to demonstrate your aptitude for the offer involved. We have papers that present thousands of real sample aptitude test questions from the archives of these organizations and detailed explanatory answers to these questions. This material will tell you what to study by presenting in full every type of question asked in the various tests. This internship past question papers will help you find your weakness, once you know what subjects you are weak in, you can concentrate your study on the area(s) that need the most work. This internship past question papers will give you the feel of the real test. All of the questions are taken from actual previous aptitude tests. On the day of your test, you will see how closely this book follows the format of the real test. This internship past question papers will give you confidence while you are preparing for the test. It will build your self-confidence as you proceed and will prevent test anxiety that cause low test scores. 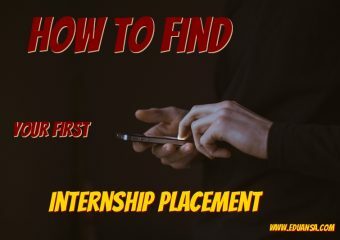 Job searching isn’t easy including searching for internship placement (whether unpaid or paid internships), especially when you don’t have much experience or many skills. Keep trying and keep applying and you will find a place for your internship programme. Your first industrial attachment will be a stepping stone to your dream job – and to your future career.